Sorry, I’m a bit too busy lately to translate this, but it’s quite revealing culturally, so if you’re a student of Chinese, it’s worth it to get out your China map and a dictionary. I have seen similar concepts for silicon valley and new york. These are so candidly funny. Splittists! Leaving off the Nansha Islands! These generalizations even exist at a local level: my former roommate said that his town was thought of as being populated by elitist, somewhat flighty culturati, while they looked at the town across the way as being inhabited by crass merchants. I enjoyed both maps exceedingly. 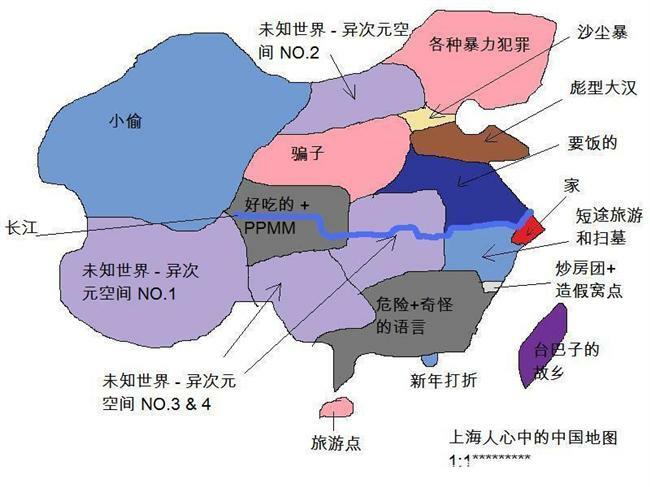 By the way, what is the PPMM on the Shanghai map? This is really funny stuff. 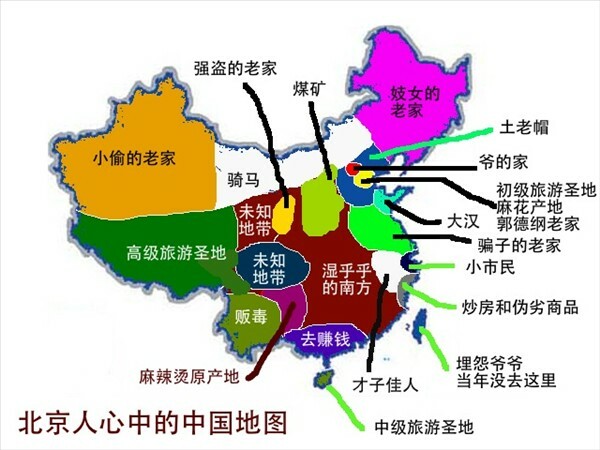 A Guangdong People’s view of China would be Guangdong and then everyone else as Northerners. The 大龄怒青年 and 愤青 map are pretty funny. A while ago, I thought it would be fun to start a blog. Unfortunately, I never made time to work on it. This above post inspired me to write two long posts on regionalism and regional identities. They may be of interest to some viewers (although they have limited comic value). These are hysterical; the Chinese are even xenophobic of themselves!